MMS FEBRUARY 2018 88 mmsonline.com BETTER PRODUCTION ON-MACHINE ME ASUREMENT measurement application, a very large number of points on the slots would have to be measured in order to attain an adequate resolution. Instead, the TC76-Digilog scans across the slot surface at a measuring speed of 2 meters per minute, generating an extremely large number of values (50,000 per second) in a fraction of the time of analog data acquisition. 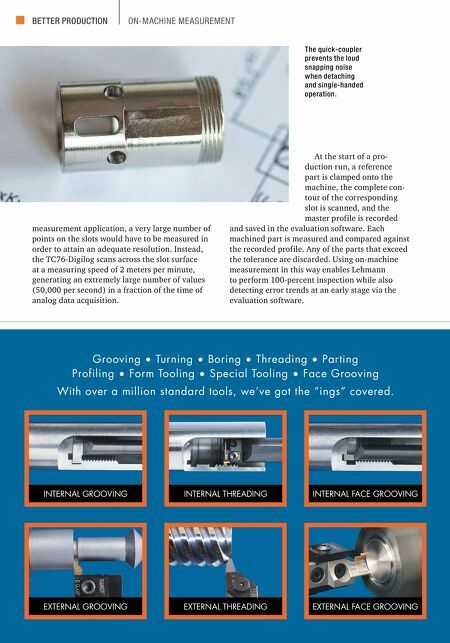 Grooving • Turning • Boring • Threading • Parting Profiling • Form Tooling • Special Tooling • Face Grooving With over a million standard tools, we've got the "ings" covered. INTERNAL GROOVING INTERNAL FACE GROOVING INTERNAL THREADING EXTERNAL GROOVING EXTERNAL FACE GROOVING EXTERNAL THREADING The quick-coupler prevents the loud snapping noise when detaching and single-handed operation. At the start of a pro- duction run, a reference part is clamped onto the machine, the complete con- tour of the corresponding slot is scanned, and the master profile is recorded and saved in the evaluation software. 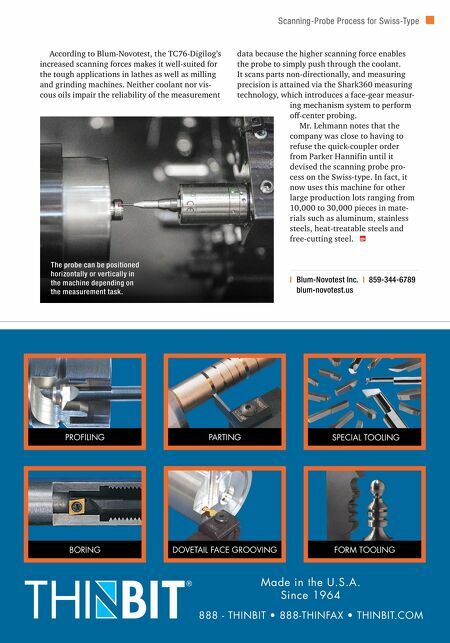 Each machined part is measured and compared against the recorded profile. Any of the parts that exceed the tolerance are discarded. Using on-machine measurement in this way enables Lehmann to perform 100-percent inspection while also detecting error trends at an early stage via the evaluation software.